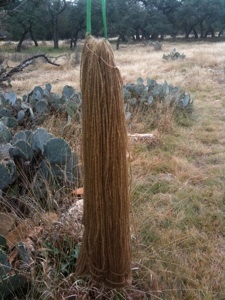 On Dec 11th I ran the first batch of water soaked mesquite wool. It is pictured above on the left. Today I ran the 2nd batch which I let sit for a little over a week more. It is pictured on the right. Same wood, just let it soak longer in water and stewed it for an hour before I introduced the alum sulfate mordanted wool. The pot was brought up to temperature and held for an hour and then allowed to cool overnight. There is not much difference between the two skeins. The 2nd skein is a little lighter but not by much. In the dye pot I thought it looked brown and had resigned myself to the fact that the yellow tone was only in the first color pull but once it was rinsed and dried the color very much matched the 1st skein gold tone. 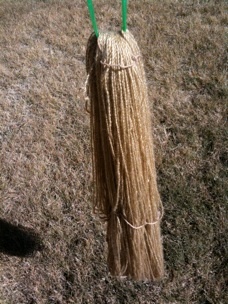 One could say that the 2nd skein lets the mohair original white shine thru. I had originally planned to run a 1:1 dye pot but decided to process all the wood at once and do a 2 part wood chip to 1 part skein to see a darker depth of shade. Even thought I ran the process twice the color depth seemed to hold well, there was not a significant reduction in color. I could have run them together and obtained about the same color. Personally I am partial to the 2nd chestnut type color as I think it makes a wonderful neutral color to offset other dark colors. Next on deck is the mesquite wood soaking in the denatured alcohol. More next week! Once I get all the tests run I’ll put some samples out to see how the color holds in sunlight exposure. Texas winter sun ought to tell us something! The first run of water soaked mesquite - the first batch looks very much like a dark myrobalan. The 2nd run clearly resembles chestnut. Definitely tannin in the dye pot!